As a customer who lives outside of their catchment area, I tend to rely on the internet, post and phone to manage the account. The internet banking has come along in leaps and bounds of late, but despite their desire to "amaze and delight" me, a couple of recent experiences have amazed me with their ability to press my buttons, but they have far from delighted me. First off, I decided to transfer my ISA to them. Their online application process was a delight and within three or four minutes the ISA was open and ready to use on the internet banking, but nowhere to be seen is their ISA transfer form. Google saved the day and after printing it off and sending it to them, I left nature to take its course. Two weeks later, I hadn't received any confirmation from them that the ISA was being transferred (most banks at least confirm receipt and advise that they have forwarded the forms to the outgoing ISA provider) so I gave them a call. I was told that they had not received the forms and that I would have to complete them and send them again. Not being in the mood to complete the paperwork, I printed it all out again to complete later in the week, however when I logged into my internet banking at First Direct, I notice that my ISA had disappeared. I phoned to ask them what had happened, and they told me that they had transferred the balance to Metro Bank as requested. 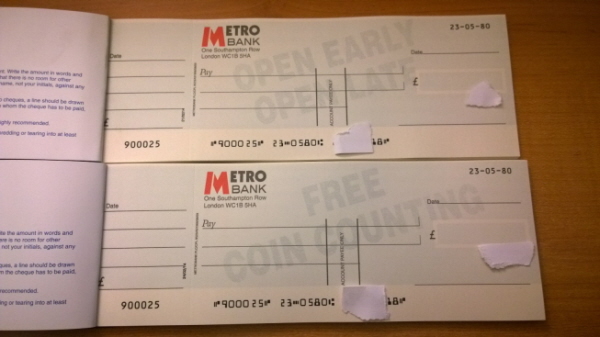 I'm not sure how First Direct managed to do this bearing in mind that Metro Bank had, allegedly, not received the form. Clearly I was amazed and delighted by having been given the run around. I recently closed my First Direct Current Account, and wanted a small overdraft on my Metro Bank Current Account in case I had any problems with the transfer. So, on a Friday night I logged into internet banking and used the online form to apply for the service. A 24 hour turnaround is suggested, so by Sunday lunchtime with no sign of a response I decided to give them a call to check that all was well. After being told to have an "amazing day" and with the assurance that my overdraft request would be dealt with "very soon", I relaxed in the knowledge that if I logged on later in the day, the £100 would be there for all to see. I ended up chasing the request again on Monday afternoon only to receive a secure message explaining that yes I could have the overdraft, but I needed to call them to complete the application. Irritated, I called them where they double checked a couple of details they already had, and proceeded to read out a lengthy document that I could have either have been sent in the post, have read online, or could have accepted as part of the online application. Further, I was told that the application then had to go through a manager so sign off. To top it all, today I received confirmation of the credit line in the post, totalling 7 A4 pages and two booklets. Other banks and building societies seem to manage to have a robust online application process for overdrafts which can be condensed down to three or four pages, a couple of tickboxes and a page or two sent in the post, all meeting the FCA's TCF guidelines. This appears to be problematic for Metro Bank, and I fail to understand why an online overdraft application form is provided if the whole process cannot be completed online. I know I'm kicking the underdog here; I have no intention of closing all of the accounts with Metro Bank because, for a bricks and mortar bank, their products are reasonably decent and, idle tittle tattle about having an "amazing day" aside, they're a likeable bunch. That said, if they're going to really create a dent in the market and hurt the big four, they're just going to have to raise their game a little.